Hillary and Brian in Twilight Park! We met Hillary and Brian through Hillary’s parents Karen and Larry, who had seen us at the Greene County Council on the Arts annual Beaux Arts Ball at Hunter Mountain. They enjoyed getting down to Nite-Time at the event so much that they thought we would be a perfect fit for their daughter’s wedding in nearby Twilight Park. Shortly after the cocktail hour ended, the rain returned, but it didn’t matter, because we were all safely inside for the reception, dinner and dancing. We got the dancing started with Hillary and Brian’s first dance God Only Knows by the Beach Boys, a unique choice on their part, and really a lot of fun for the band to perform (the vocal breakdown section at the end was a challenge we were all psyched to meet). After that we launched into a medley of horas and then we were off and running. Hillary and her mom Karen, did an amazing job of decking the place out for the wedding. Hillary mentioned to her mother that she would love centerpieces of snapdragons (one of my favorite flowers) and white birch. 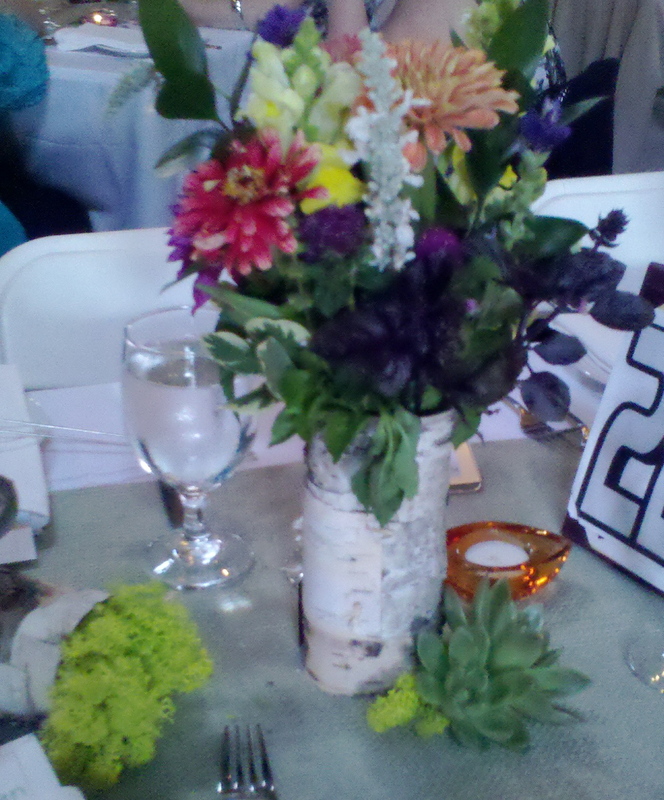 Karen got to work and made the most beautiful centerpieces that she accented with succulents that the guests were invited to take home after the event. Mine are thriving by the way, thanks guys! 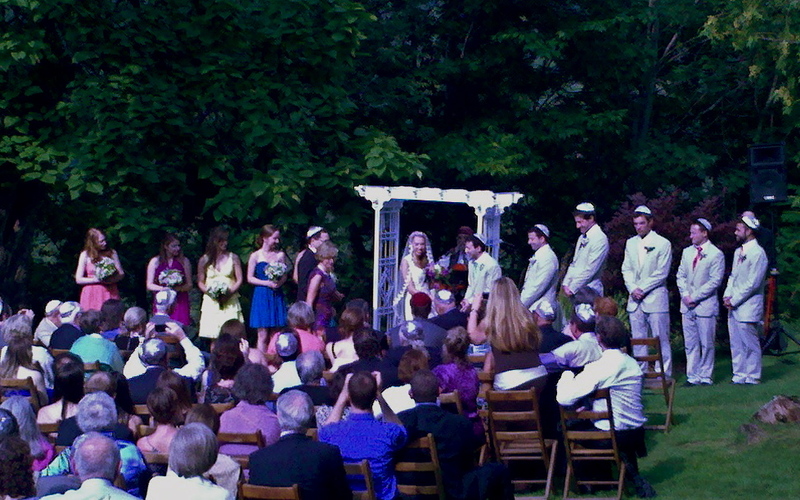 All in all it was another great wedding with a wonderful couple in an amazing setting. Hillary and Brian had a great time as did their parents, family and friends. The rain held off while we were all outside and once we moved indoors there was so much dancing and revelry that I don’t think anyone noticed the occasional showers outside! Hillary sent Yves a note of thanks a couple of weeks ago, check out A Thank You from Hillary and Brian on our review page. A Thank You from Hillary and Brian! Thank you, Yves. We very much enjoyed having you play! Everyone was dancing up a storm! Brian and I agree that our wedding day was perfect. Please feel free to use us as a reference. We just got the disk of pictures and there are some great pictures of you and the rest of the band in action. Would you like me to forward some along? 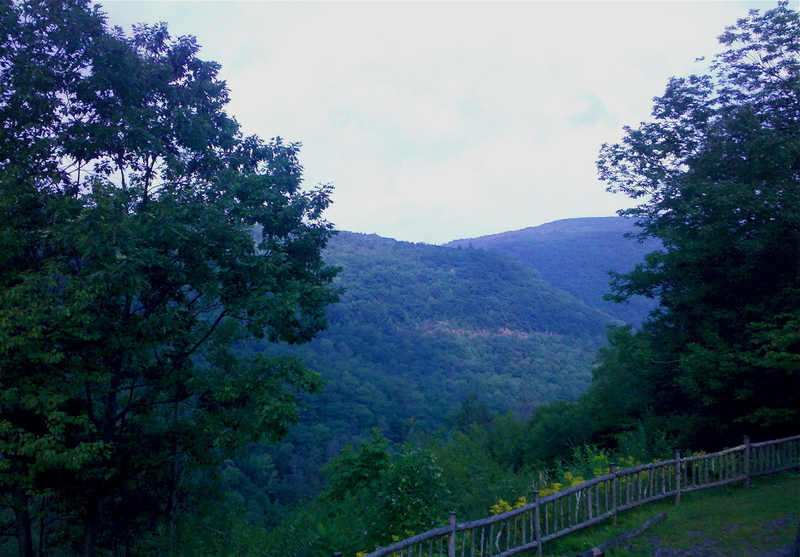 The view from the deck at Hillary and Brian's wedding.